The following 4 items were added to PAP on 10/28/2016. Emancipatory Nursing Praxis: A Theory of Social Justice in Nursing. A Review and Critique of Advances in Nursing Science Articles That Focus on Sexual Health and Sexual Rights: A Call to Leadership and Policy Development. 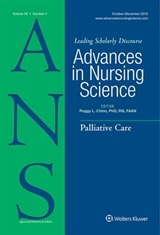 Reorienting Esthetic Knowing as an Appropriate “Object” of Scientific Inquiry to Advance Understanding of a Critical Pattern of Nursing Knowledge in Practice. A Qualitative Study of Difficult Nurse-Patient Encounters in Home Health Care.